Behind Barres - Classical Music For Ballet Class is a unique series of CD recordings of music for ballet class created by master clinician Judy Rice and renowned pianist Paul Lewis. 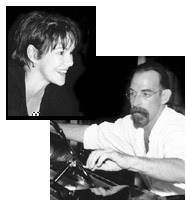 The music of Behind Barres features the world's great composers ranging from Bach to The Beatles. It is arranged and performed by Paul Lewis and recorded at Solid Sound Inc. in Ann Arbor, Michigan. This DVD series with Judy Rice encompasses pointe shoe fitting, ribbon and elastic placement and sewing, manipulation of the shoe so that it is more comfortable and functional for the dancer, and the correct way to tie ribbons. PAUL LEWIS is widely recognized as one of the leading ballet accompanists in America. Mr. Lewis' 26 years of experience include long standing positions with the Cleveland, Atlanta, San Francisco Ballet companies, and The Joffrey and Marin Ballet schools. Currently Mr. Lewis resides in Chicago where he serves as company pianist for The Joffrey Ballet of Chicago.